How to solve “disk does not contain a Windows XP-compatible partition” during installation? 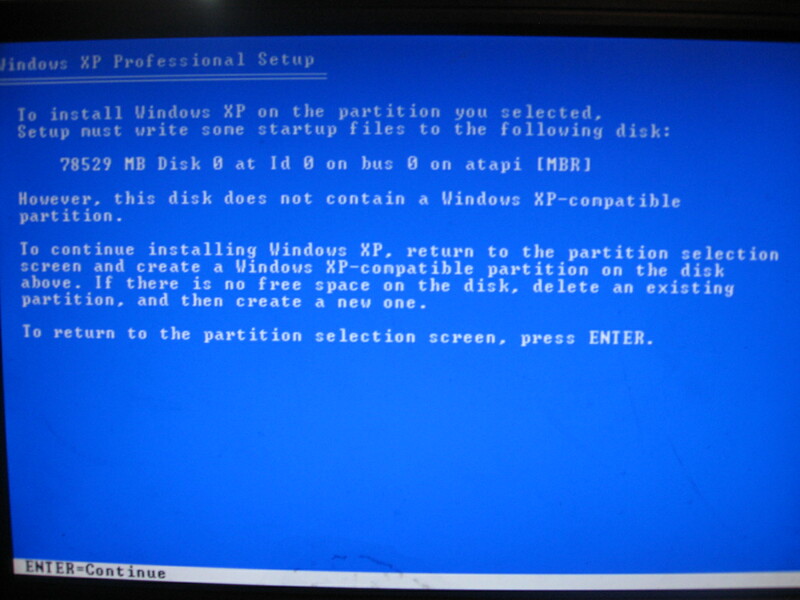 To continue installing Windows XP, return to the partition selection screen and create a Windows XP-compatible partition on the disk above. If there is no free space on the disk, delete an existing partition, and then create a new one. When I try to create a new partition in the unpartitioned space, I get the same error. I've tried this on two separate XP CDs with the same results. Plug out the hard drives that contain any data at the moment. Try installing Windows XP with only the empty hard drive connected to your computer. And write back what happens, its also advisable to always install Windows before you install any linux operating systems on your computer but that's just in my opinion. You have to delete all partition no matter if it said NTFS, Raw or unknown delete all of them one by one pressing "D" and confirm pressing L. After that you get a new screen with the whole space of the hard drive and 4 ways to reformat you hard drive select the 3rd "Partition like a NTFS' and press enter ,when formatting is completed , XP installation set up it will continue. The simplest way to work around this XP installer bug would be to run "sudo cfdisk" in Ubuntu and just partition drive 2 manually, create a single large ntfs partition, then restart the XP installer. According to this discussion it could be a problem with the drive itself. Before returning it for replacement, you might try unplugging the cables, cleaning the connections and replugging. if the complete drive was originally a primary partition and you made it now into 2 partitions by creating another partition then that partition must now become the primary partition for windows to install. Just make the new partition the primary. Use partition wizard or whatever partition software you may have. 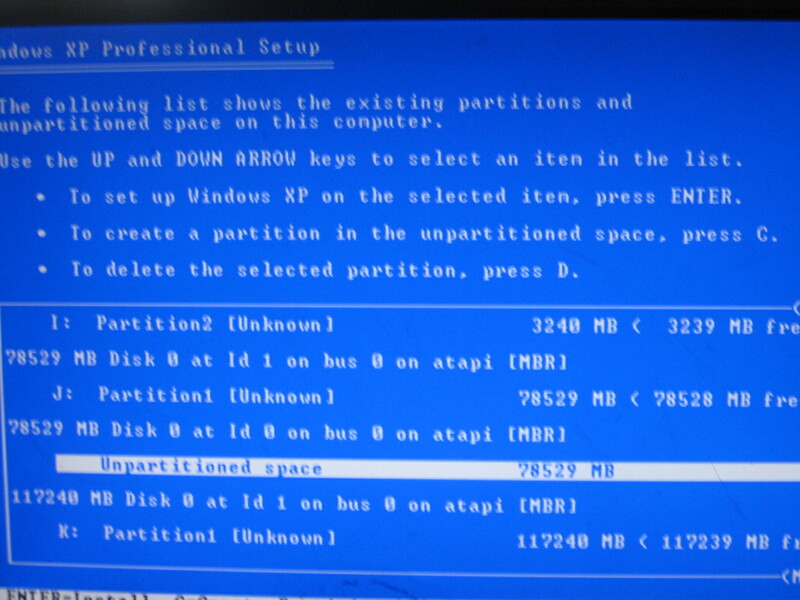 The simple technique is that 1.make partitions as much as possible in your hard drive and dont leave unpartitioned space .when there is no partitioned space ,the window will not.give error. Not the answer you're looking for? Browse other questions tagged windows installation or ask your own question. How do I solve the BSOD that appears during my Windows install? "disk does not contain a Windows XP-compatible partition” during installation? How to fix Physical Memory dump error during installation of windows xp ? Why PC not started?